Last night, I (with my family and 300,000 of my friends and neighbours) descended on Melbourne’s CBD for the inaugural White Night Melbourne event. It’s an all night party celebrating the arts running from 7pm Saturday to 7am Sunday. The organisers had hoped for 100,000 people so they must have been a little blown away with the final estimates. From shortly after 7pm, people on foot took over the streets. The trams weren’t running. Cars had nowhere to go. People lined the streets from side to side. For us, with two young kids, the crowds were a little overwhelming. The performers and the art installations were a little hard to see. If you looked hard and watched the crowds, there were gems to be found like the performer pictured above. 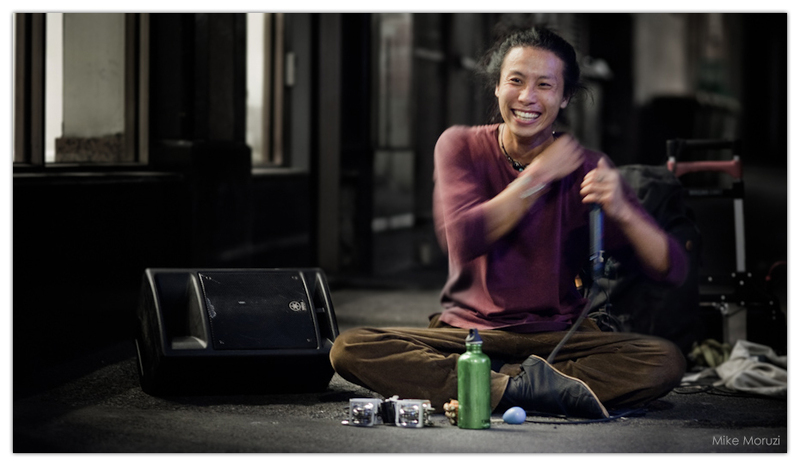 He was the voice half of a duo making some great music in Flinders Lane. How happy is this guy! I don’t know if it’s going to be an annual event now, but we might have to leave the kids at home next time so we can be more mobile and stay out later. It’s hot, humid, crowded, chaotic, and a lot of fun. The Mindil Beach Sunset Market northwest of Darwin city, in the Northern Territory, is a local cultural sampler and more than a bit feral. The first challenge is parking. When you arrive, cars are parked all over the place. For the most part, the cars are in traditional parking lot kinds of lines, but the car park is a dusty, grassy field. When it gets full, the cars start getting wedged any old place. If you come late (as we did) you might have a to take a couple of passes through the labyrinth until you find a nook big enough to squeeze your car into. Pay close attention to where you put your car! Once in the market, you’ll find food stands of all ethnicities, arts and crafts vendors, clothing vendors, and performers. All this and it’s right up against a gorgeous beach that stretches off into the distance in both directions. Of course, it’s a sunset market, so as the sun drops below the horizon, the crowds come up from the beach and the market gets really crowded. Now is a good time to find a patch of dirt near some of the buskers and catch the evening shows. There are bands, jugglers, dancers, and this fire breather. 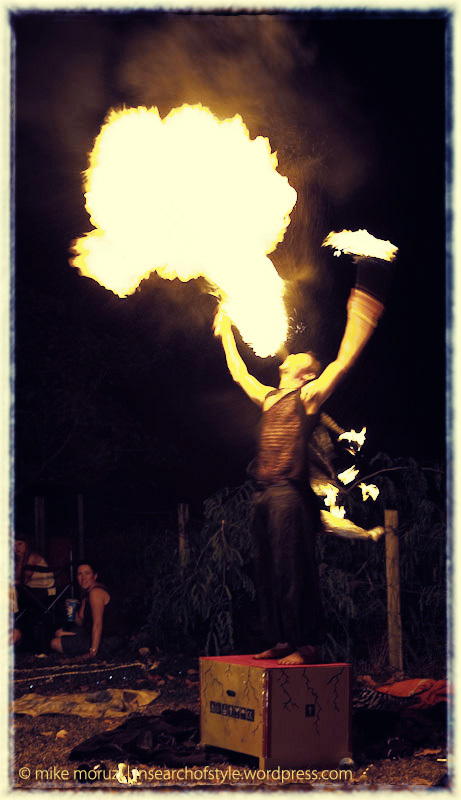 He was a man of many talents with comedy, juggling, skipping (with a flaming rope), and fire-breathing all part of his repertoire. I think he even juggled machetes at one stage. His big finish is captured above. If you want to see the market, you’ll have to plan ahead a little. The market only runs on Thursdays and Sundays during the Dry season (late April to October).